Yes, that’s right… today’s Wednesday, and I “missed” yesterday’s blog post. Actually, that was on purpose because I’m shifting blogging back down to ONCE a week – weekly on Wednesdays. Why? 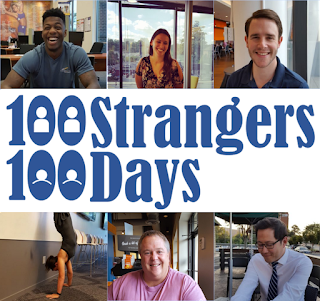 Because I have started a little side project called 100 Strangers, 100 Days. 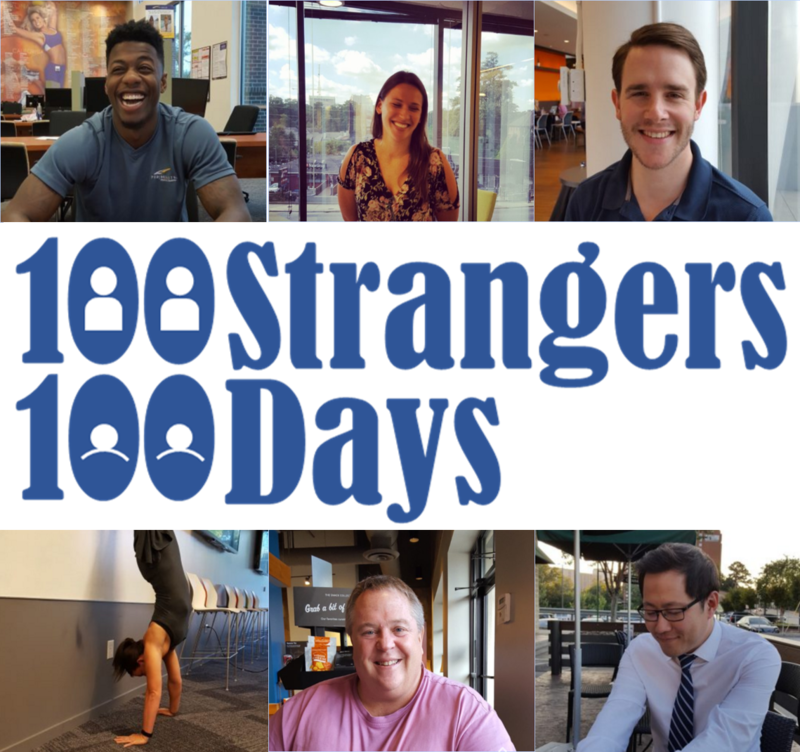 You might be able to guess what it’s about already… I’m meeting 100 Strangers over the course of 100 Days. I started last Saturday, September 17th. I should be wrapped up with my 100thStranger on December 26! How wild is that? Everyone is fascinating and has some story to tell. I’m fortunate and grateful to have met some really amazing people. These amazing people have shaped who I am, and I’m proud of who I am and who I am becoming. I have looked at relationships as incredibly special to me – a realization surfaced from my time at Emory. That is, how much people and connections mean to me. So on my hike, ironically, I didn’t end up meeting the man walking beside me as my mind went straight into thinking about documenting how I meet others – by reaching out, saying hello, and digging just a little bit deeper… with Strangers. For whatever reason, the number 100 crept into my head for both 100 Strangers and 100 Days – had a nice ring to it. I thought about 30 days, but that didn’t seem very ambitious. 50 just sounded like an odd number. So 100 Strangers. 100 Days. Let’s go. The purpose of this project is many, many fold. To inspire connections. I want people to get out from their cellphones texting and “Snapchatting” to get to know people around them. Myself, I see so many people in my office, but do not say hello. I may say, “hi”, or give a friendly nod, but that’s the extent. I want to connect, and I believe we should all connect as social organisms. Plus, serendipity is a wonderful thing. To motivate action. Like I said, 100 days is, I think, ambitious. I thought of the idea for this and within two hours, I was interviewing my first Stranger. Within 6 hours I had the website up. I want others who have passions or questions or a project in their heads to turn those questions to answers… to turn ideas into reality. I’m an entrepreneur because I execute. I want others to realize it’s not hard to start something magical. To challenge myself. I wrote Postmortem of a Failed Startup: Lessons for Success last year. This could very well be another book down the line for me. That, and I want another personal/ passion project other than the passion for the startup I work for. With 1 Stranger per 1 Day, I want to show it’s not hard to get out of our comfort zone. Just one little connection per 24 hours. It’s an exercise not to rush 100 connections, but to illustrate it’s possible on a consistent basis. Show the world we can be compassionate and vulnerable. I can ask some deep, personal questions to which I hope to hear truths. I want to challenge others to be vulnerable to not just answering questions to me, but to sharing their story with the world (and their picture). It’s an incredible thing to ask, but I want to ask to let others make that choice… not me make that choice for them (which I have a terrible tendency to do – make choices for others). It’s a trust thing. To encourage us to get to know those who we don’t consider Strangers. I have friends now sharing THEIR answers to questions like they were Strangers. They want to share with me! Meanwhile, I have friends now asking THEIR friends these questions because they want to know what motivates them. It’s exciting to watch as we consider how people around us could be Strangers in some way, too. To change the world for the greater through entrepreneurial endeavors. I have no idea where this is going to go other than 100 Strangers… 100 Days. I may ask some more friendlier faces as I realize, too, that some familiar faces are just surface-level connections. As I said earlier, I want deeper connections, so maybe I go beyond Strangers. I don’t know if this will be a book. I don’t know if this will amount to anything “commercially viable”, but I’m good with that. I hope this journey motivates bigger effects on us as a community, as a nation, as a race. We all have common threads as well as beautiful differences. I want us to embrace each other and the effects of this journey for greateraspirations whatever they may be. So stay tuned and check out these beautiful Strangers on http://100strangers100days.com – I’m on Day 12 today. Also, you can follow the journey via Twitter @StrangersXDays or Instagram @StrangersXDays. 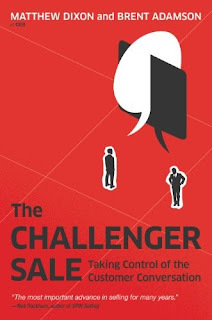 It took me a little longer than I thought, but I just finished Matthew Dixon and Brent Adamson’s The Challenger Sale. Another great book recommendation from a sales rep who was actually selling to me. This book builds on the SPIN Selling as the next big innovation in sales. Needless to say, I learned a lot from the book, and enjoyed it immensely. In fact, after just reading the first few chapters, I started to hack my selling style immediately to be more Challenger-oriented. What was interesting was that out of the different selling personas, the Relationship Builder typically had the lowest sales success. This was daunting for me as I typically harp on the importance of relationships, and though, I do take on several attributes of a Challenger (like teaching and tailoring, especially), I still may be very Relationship-oriented. In today’s noise-filled world, Challenger sales reps focus and drive value for prospects from the get-go. They are focused. They are tenacious. The essence of the Challenger sale is about teaching prospects insights they do not know about their industries, tailoringthe solution for the prospects’ businesses, and taking control of the sales process. Relationship builders focus on convenience for customers while Challengers focus on delivering value. Challengers are comfortable pushing prospects out of their comfort zones – challenging prospects to think differently. Prospects are looking for ways to get the competitive advantage – new ways to cut costs, increase sales, expand markets. It’s about insight, and this is how Challengers approach sales. They provide insight into the industry and highlight a problem the prospect didn’t know he had, and they hammer home the urgency to solve it. Marketing is the “insight generating machine” arming sales reps with quality material to teach and engage prospects. This is one of the reasons why infographics, white papers, and case studies are valuable collateral for reps. The Challenger builds a team of advocates to ensure the buyer has backing – mitigate the risk of the buyer. The Challenger teaches why the problem is urgent; else, the customer won’t see the importance of solving it (now). Sales leadership is about sales innovation – how leaders can move stagnant deals forward. Sales innovation is the single biggest sales-related attribute of a world-class sales manager. Sales success is about being able to tackle the things you don’t know, not about what you do know. It’s about being creative and innovative to solve problems. Great read especially as a relatively “young” sales professional not having formal experience before diving in when Body Boss was started. Next up for sales book reading – Predictable Revenue. The 3 Sins of sales management (from Mark): (1) Poorly designed selling philosophy (culture). (2) Too tolerant of mediocrity. (3) No system for selling or managing sales. No surprise the panel touched heavily on instilling and persisting a great sales culture. Common phrases throughout the panel included: “surround yourself with top talent”, “raise the bar”, “do not tolerate mediocrity”, “structure”, “understand a sales candidate’s ‘fire’ or motivator”, and “on-going training”. “Think like a big company” – this really hit home for me as I have been rather capricious in putting down learnings from selling (and marketing) SalesWise. I have a lot of knowledge of what works, what doesn’t work, and the like, but it’s all locked away in my head or in disparate sources (notebook, computer files, etc.). I should document everything in a single place – a living, breathing sales playbook accessible by all. Instilling structure in the sales organization ensures high productivity and a sustainable sales culture. It highlights the top performers and separates the laggards. Cull the laggards as quickly as possible (they can be like poison), and the average of your team immediately rises. Promoting high-performing sales reps to leadership positions does not always work. It can also have an exponential effect of decreasing sales (you took your best performer, after all) while poorly leading an established sales team. Recognize not all reps should be leaders, but it’s a leader’s job to disseminate the learnings of high performance to the rest. Recognize, too, rep coaching should be tailored to the individual. 10 x 10 = 100. The first “10” is you’re only aware of 10% of the whole problem. Dig deeper. “x10” represents the fear of addressing the problem is actually 10 times the reality. Consider your delivery to be productive. And “100”… because problems are typically solved 100 days late. Second straight post I want to share a story with you I’ve heard a couple times. But more recently, heard it from a fellow entrepreneur friend with a slew of great opportunities coming one after the other. And yet, he hasn’t grabbed any of the opportunities yet. What are your thoughts? How do you relate? A man was trapped in his house during a flood. He began praying to God to rescue him. He had a vision in his head of God’s hand reaching down from heaven and lifting him to safety. The water started to rise in his house. His neighbour urged him to leave and offered him a ride to safety. The man yelled back, “I am waiting for God to save me.” The neighbour drove off in his pick-up truck. The man continued to pray and hold on to his vision. As the water began rising in his house, he had to climb up to the roof. A boat came by with some people heading for safe ground. They yelled at the man to grab a rope they were ready to throw and take him to safety. He told them that he was waiting for God to save him. They shook their heads and moved on. The man continued to pray, believing with all his heart that he would be saved by God. The flood waters continued to rise. A helicopter flew by and a voice came over a loudspeaker offering to lower a ladder and take him off the roof. The man waved the helicopter away, shouting back that he was waiting for God to save him. The helicopter left. The flooding water came over the roof and caught him up and swept him away. He drowned. Recently, I had the opportunity to travel to Chicago for a photoshoot (yes, I was the talent – surprise!). I also used it as a chance to get away. When my colleagues found out, they wished me luck, have fun, and should be great. My response: “yeah, we’ll see”. Not sure why I responded that way, but one of my colleagues laughed and shared with me the below story to which I very much relate to (and not just because the setting is China). Once upon a time, there was a farmer in the central region of China. He didn’t have a lot of money and, instead of a tractor, he used an old horse to plow his field. One afternoon, while working in the field, the horse dropped dead. Everyone in the village said, “Oh, what a horrible thing to happen.” The farmer said simply, “We’ll see.” He was so at peace and so calm, that everyone in the village got together and, admiring his attitude, gave him a new horse as a gift. Two days later, the army came into the village to draft new recruits. When they saw that the farmer’s son had a broken leg, they decided not to recruit him. Last week, I posted one of the most important blog posts since I started except… I lied. I didn’t quite take that vacation/ break. I haven’t taken a vacation in quite a while. Even in late December and early January when I went to Orlando and San Fran for family vacations, I worked. A lot. This past Thursday, I still ended up working 6-7 hours even after everyone at work messaged me to get offline. It’s a hard to be “okay” to turn off. Early in the week, I handled several marketing tasks, but I hadn’t finished any of my sales and customer success tasks. These efforts boiled over into Thursday, my supposed time off. Having lived through the roller coaster of Body Boss and then last year’s anxiety-filled summer, knowing to turn off and actually doing so is a work-in-progress. In fact, like working out, exercising vulnerability, speaking, writing, etc., taking time off should be a constant practice. Harvard Business Review has a great article about resilience – “Resilience Is About How You Recharge, Not How You Endure”. It’s a great reminder that we, as a society, like to applaud the men and women who continue to “grind it out”. However, grinding it out leads to burning out. The brain is like a muscle – requiring time to recharge. Professional athletes exert exemplary effort in bursts (games) but set aside time to recover. Without recovery time, athletes become susceptible to injury and operate below-par. So, the moral of today’s post: taking time off is a constant practice. It’s easy to prescribe others to take time off, but it can be hard for us to take the very medicine we prescribe. It’s a constant practice and process that requires diligence with an eye towards the greater goal.